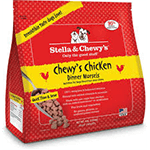 Feeding your dog a raw dinner has never been healthier or easier! 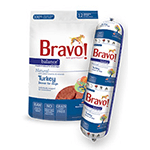 Available in chub and patty varieties, Bravo Balance raw diet meets the AAFCO standard for complete and balanced nutrition for all life stages. 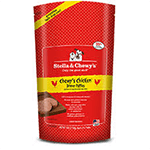 Formulated with meat, bones, organs and garden vegetables plus essential vitamins and minerals, these recipes offer everything a dog needs for a long, healthy life. Made with 95% real meat, organs and bones, 5% fruits and vegetables and other wholesome ingredients, and 0% grain or artificial ingredients. Instinct RAW ingredients are frozen at their peak and never cooked to preserve their nutritional integrity. They use ingredients closest to their natural state like real meat and non-GMO fruits and vegetables. Primal Formulas offer the convenience and benefits of a well-balanced, safe and wholesome raw-food diet without having to grind, chop, measure or mix the ingredients yourself. 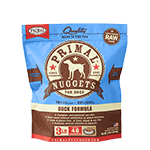 Primal taken the time to sustainably source, carefully formulate and lovingly produce a nutritious, human-edible raw diet that is easy for you to serve and delectable for pets to devour. The proof is watching them lick the bowl clean and thrive! 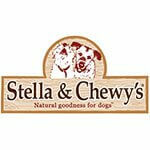 Stella & Chewy’s offers frozen raw dinners for dogs in patties and morsels. 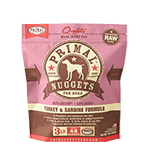 It’s pure, pristine and economical raw nutrition you can feed your dog with confidence. Recipes are 95%grass-fed, cage-free, wild-caught meat, organs and bone combined with 100% organic fruits and vegetables and fortified with vitamins, minerals, probiotics and antioxidants. Meals are 100% complete and considered a balanced dinner. No grains; no gluten. Tucker’s believes that simple carnivore diets offer maximum absorption. That is why their formulas are 95% muscle meat, organs, marrow, and bone with 5% natural pumpkin. Grandma Lucy’s ingredients and philosophy have not changed since they began in 1999 and they remain committed to using only the best ingredients from specialized suppliers. Their gentle freeze-drying process removes 92% of the water contained in the ingredients, leaving a food that is lightweight, compact, and shelf-stable and preservative free. The characteristics of raw food are retained as well as the flavor. Packed with vitamins and proteins, Vital meals use high-quality meats, poultry, and vegetables farmed in the United States. They lock in nutrients naturally by gently cooking at low temperatures. That means your pet gets more nutrients from ingredients we put in. Like amino acids, the basic building blocks that help dogs grow, thrive and get the most out of life.